Both India and Japan seem to have shown flexibility to ensure a positive outcome. In today’s multipolar world stamped by an asymmetrical power distribution, Tokyo and New Delhi figure on every analyst’s list of major power centres. The relationship between the two nations impacts the Asian power balance, in the backdrop of China’s economic and military rise and a marked tendency to assert itself. Hence, Prime Minister Narendra Modi’s visit to Japan, November 11-12, was imbued with considerable significance. The visit was the occasion for the third India-Japan annual summit during the Modi government’s two and a half-year-long tenure so far. With the two Prime Ministers having met for the eighth time, the relationship has advanced noticeably in this period. The question to ponder is as to what additionality was achieved in Tokyo last week. It has produced tangible results. The most salient gain is the conclusion of the agreement for cooperation in the peaceful uses of nuclear energy. This was pending for several years, causing much uncertainty. It now opens the way for cooperation involving Indian, American and Japanese companies in the field of civil nuclear cooperation. Both India and Japan seem to have shown flexibility to ensure a positive outcome. Besides, nine other agreements and MoUs were signed covering diverse fields. The future of Japan-India partnership, Mr Modi stated, is “rich and robust”. Another notable feature is the progress registered on one of the mega projects, namely the Mumbai-Ahmedabad high-speed rail project. Consultancy work is set to begin next month; construction will commence in end 2018, and the operation starts in 2023. The 58-para joint statement, issued on November 11, is significant for its several elements. It highlights the synergy between India’s “Act East Policy” and Japan’s “Free and Open Indo-Pacific Strategy”. The partnership between India and Japan brings “peace, stability and balance in the region”. The para on countering terrorism is very strong and explicit, with India and Japan calling on Pakistan to bring to justice the perpetrators of terrorist attacks in Mumbai in November 2008 and in Pathankot in 2016. India reciprocated this by showing ample sensitivity to Japan’s need for security in its neighbourhood. It joined the Japanese government in condemning “in the strongest terms” North Korea’s continuing development of nuclear weapons and ballistic missile programmes. With the right protocol followed, the “C” word does not figure anywhere in the joint statement, but many of its paragraphs will be of special interest to Beijing. One in particular is directly addressed to it where India and Japan speak clearly about the commitment to respecting freedom of navigation etc., based on the principles of international law. Specifically, on the South China Sea, the two countries have called on “all parties” to show “utmost respect” to the United Nations Convention on the Law of the Sea (UNCLOS) and to resolve the disputes by “peaceful means”. Post visit, India-Japan relations need to be assessed from two principal perspectives, namely of the recent history and the changing geopolitics in Asia. First, the backdrop of developments in the past one and a half decades confirms an ascending trajectory. Since PM Yoshiro Mori’s visit to India in 2000, the two nations began shaping what they called a “global partnership”. During PM Manmohan Singh’s 10-year long innings, the concept evolved significantly as the two governments, with Shinzo Abe as PM in Japan, upgraded the relationship to “global and strategic partnership” in 2006. The year 2014 was of special significance. Mr Abe, PM again, visited India in January to hold discussions with the Manmohan Singh government, following the maiden visit of Emperor Akihito in end 2013. A few months after Mr Abe’s visit, PM Modi visited Japan, his first foreign tour outside South Asia. This is when the relationship was elevated to the “special strategic and global partnership”. Mr Abe was in India again in December 2015 to craft, along with the Modi government, “the India-Japan Vision 2025” that reflected the shared view of a long-term strategy towards peace and prosperity in the Indo-Pacific Region and the world. 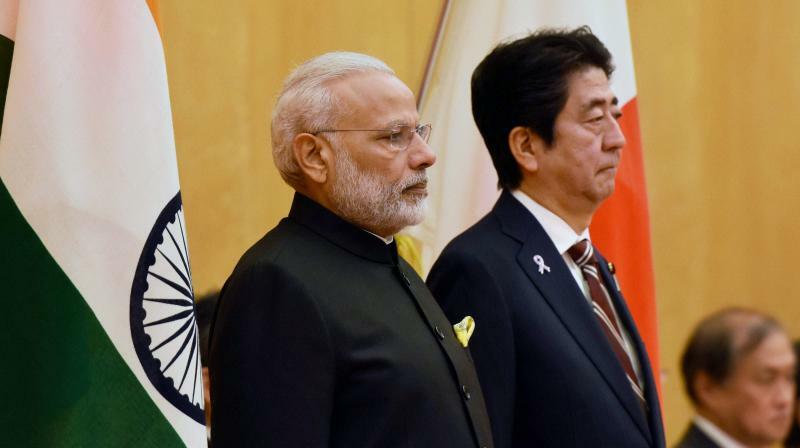 The Modi-Abe discussions in Tokyo last week revealed a deep sense of mutual satisfaction over the current state of cooperation, with its twin focus on strategic and economic facets. Second, the changing dynamics of Asian geopolitics make it evident that China’s assertive policies since 2009, particularly on the South China Sea/East China Sea issues, reached a new watermark in 2016. With the US preoccupied with its presidential election and developments in other regions, President Barack Obama came up with a weak-kneed strategic response. The US policy of pivot/rebalancing proved ineffectual. Consequently, Asean went into a disarray. Smaller countries (viz. Laos and Cambodia) chose to join the China camp. The Philippines performed its own pivot, announcing its “separation” from the US. Other member-states hunkered down, beset with anxiety as well as an instinct to explore accommodation with Beijing. One thus sees the contours of an emerging alliance of angst, with Japan, India, Vietnam, Indonesia, Australia and probably South Korea as its key constituents. How does the US view the fast changing geopolitical scenario in East Asia? We will have to wait for a few months to know the answer. President-elect Donald Trump has been ambiguous in articulating his Asian view and his likely China policy. His constant refrain during the election campaign about making Japan pay for its security and about getting back US jobs that were lost to China and India, will now face a reality check. Experts are agreed that, given India’s strengthened relations with the US and Japan and escalating tensions in China’s relations with India and Japan, Asia’s largest democracy — India — and the oldest and most prosperous democracy — Japan — are “natural partners”. The Tokyo summit last week was a confident step in guiding the two nations towards the desired direction.